Posted December 12, 2017 & filed under Lesson Plan, Notebook, Student Writing. On my parents’ porch, I feel a gust of air as I walk out the screen door. Am I hot? Am I cold? No. I am just right. But even here, there’s a twisted feeling in my gut, my long lost dog sits in ashes on the top shelf of my parents’ desk. The screen door separates me from the air conditioning and the wild weather. I rest my arms and elbows on the eleven-year-old railing and look down at the ditch under our driveway. I used to catch tadpoles there. On this porch I hear the waves beating on each other, the waves I body surfed on all afternoon. My childhood flashes before me. Blink! All the memories of my siblings, preschool, my friends and cousins. I look behind and see the little gray table with the tall chairs where my parents come to talk. I could sit on this porch for the rest of my life, listening to the waves. I feel at peace thinking of my first friend, my dog, my childhood, what I felt as a baby. All the responsibilities which I have now will only increase in high school, college, and adulthood. I feel all my life again and again in a matter of seconds, though I have had ten long years on earth. I may not be old, but I have seen more than I think is humanly possibly. On this porch I am all I’ve been, all at the same time, even in my dreams. It is nothing but a miracle. Posted July 18, 2017 & filed under Lesson Plan, Notebook, Student Writing, WITS People. With younger children, this concrete activity called “Rubber Band Stretching” works well. Demonstrate how a rubber band starts out small and can be stretched much larger. Read a simple sentence out loud, and ask for suggestions about how to expand it. After a student successfully stretches a sentence by adding new words, hand her a rubber band ball. When a second student stretches the sentence further, the first student passes the ball to the second. The game continues until it is impossible to stretch the sentence anymore! Students then apply the lesson to a piece of their own writing. 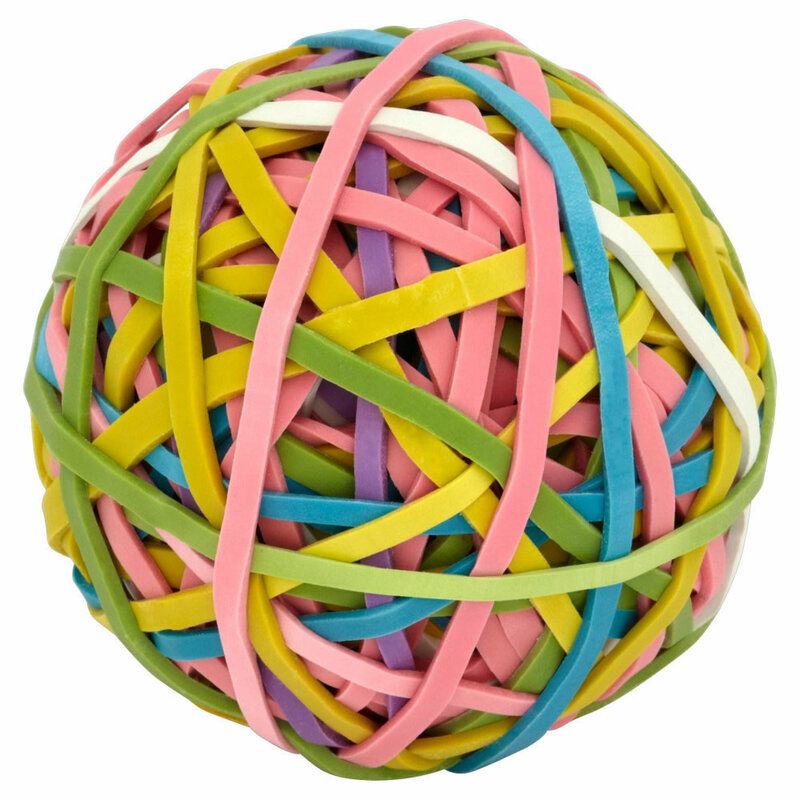 With older students, the rubber band can be used to discuss sentence length in more complexity. Bring in a strong piece of writing that includes short, medium, and long sentences. Discuss the various effects. If you have a geo board, you can actually record or map out the sentences using rubber bands. Show how the rhythm of a piece changes depending on sentence lengths. As a spinoff activity, ask students to map out sentence lengths in advance. Then, try to write a paragraph that fits, and notice how the paragraph sounds. For older students, it is empowering to see how they can control the rhythm of their piece just through sentence length. Posted March 5, 2015 & filed under Classroom Reflections, Lesson Plan, Notebook, Student Writing, WITS People. Mischievians Invade Meadow Wood Elementary! My cooperating teachers at Meadow Wood Elementary, Tabitha Peña and Hali House, are the best a WITS writer could ask for: enthusiastic, supportive, and eager to extend WITS lessons to their own teaching. We exchange book suggestions, ideas for revision, and strategies for reaching underperforming students. They open their classrooms to me and work alongside the kids during WITS. One recent effort so inspired Ms. House that she made it her own. I’d brought in William Joyce’s The Mischievians, a book about those mysterious creatures swipe TV remotes and cell phones, mislay or devour homework, and generally cause embarrassment and trouble. We both love Joyce’s work, including Rolie Polie Olie and the Christmas tale Santa Calls. I’d chosen The Mischievians because it’s so funny: everyone relates to the misplaced iPad or mismatched socks. The illustrations are just as clever. The story follows a Q & A format: the questions in a child’s voice and the answer like a formal encyclopedia entry. We read sections of the book, the students brainstormed new Mischievians, and finally they wrote their own questions and answers. The students completed their drafts and read some aloud. We will revisit the stories in several weeks to select and revise pieces for our class anthology. For now, for me, the lesson was over. But not for Ms. House. She promptly purchased her own copy of The Mischievians for the classroom and displayed it on an easel at her desk. Ms. House read their pieces, providing feedback and editing advice. After allotting class time to revise and recopy their work with illustrations, she created a bulletin board to display all the finished pieces. I think so, too. I was beyond thrilled that a lesson—a new, untested lesson at that—had struck such a chord with both students and teacher. Here are some samples. Q: Whenever I’m supposed to be quiet, I whisper to my neighbor. Then my voice gets louder until I get into trouble. Why does this happen? A: There is a Mischievian on the loose called TalkeyMer, TalkeyPants. A: There are four of them in your mouth: Down, Up, Right and Left. Q: How do they make you talk? A: They jump up and down and make your mouth talk. Once your mouth is moving, your voice wants to talk. They jump harder and harder until your voice gets louder. Posted April 26, 2014 & filed under Lesson Plan. Everyone loves a good riddle. It works the brain. Pick an animal or object or image and write a riddle poem. Choose three surprising or interesting clues to describe your animal or object or image, but don’t tell us the answer. Make us guess! Posted April 19, 2014 & filed under Lesson Plan, Notebook. Once you write your own poem, you can share your poem on Instagram #WhereWordsFly @WITSHouston. Happy writing! Posted April 12, 2014 & filed under Lesson Plan, Notebook. Writers observe the world around them and gather ideas for writing from everywhere—the ground below, the sky above. Choose an action verb such as weave, sew, flip, forge, glue, knit, breathe, build, hammer, burn, blow. Use this verb in the first line of your poem, such as “I will burn you a story…” Then, keep writing by imagining where your story would come from (the air you breathe? the dirt between your toes? the fire in your heart?). Posted December 9, 2013 & filed under Lesson Plan, Notebook, Student Writing, WITS People. The idea of the thoughtshot comes from The Reviser’s Toolbox, a great book by Barry Lane. After a student finishes a story, encourage him to find places where he might add thoughtshots. Barry Lane breaks down thoughtshots into three categories: flash-forwards, flashbacks, and internal monologues. I have found that lessons on flash-forwards and flashbacks go a long way. Students become adept at finding places in their rough drafts where they can add a related memory from the past or ruminate about the future. Be sure to show students examples from books that they are reading or texts in their language arts curriculum. These models will reveal to them the “code words” that signal a flash-forward (I imagine, I think, If, etc.) or a flashback (I remember, Once, In the past, When I was young, etc.). Some WITS teachers encourage students to use arrows in their writing to indicate where they are adding a flashforward or a flashback. When I walked into class today, the teacher said, “Test!” My eyes popped open wide. This was not the kind of news I needed on a Monday. Then, I accidently forgot to put away my backpack, and Molly tripped on it, and the teacher gave me the eye! When I sat down, I missed my chair because SOMEONE had moved it. Now, the teacher is blabbing on and on about how nice everyone looks today, which reminds me that the teacher told us last Friday to wear a shirt and tie on Monday for School Picture Day. I’m wearing a Hawaiian shirt with orange flowers because Mom forgot to do the laundry! I bet this photo will turn out worse than last year’s when my hair was green. I can picture my parents pulling out today’s photo at my wedding. “Look who you’re marrying!” they’ll say, and everyone will laugh! I knew this was going to be a horrible, messed-up, rotten egg kind of day. Revision is difficult to teach, but given a few (but not too many) techniques, students are able to make their stories better. Posted November 7, 2013 & filed under Lesson Plan, Notebook. Revision is not easy. Even for the professionals among us, revision can be tricky. And teaching revision to young writer can be a real doozy! At WITS we practice stealth revision. That means that we break complex process of revision into parts and introduce those parts one by one. Here’s one example. After a student finishes her story, ask her about the different emotions in the piece. How would she describe the feeling that goes with each part? Does she need to add any clarification? If so, get her to mark the place in her draft with a cloud symbol. Then, on a separate piece of paper, the student can draw a cloud symbol and write inside it what the character was feeling at that moment. The “cloud” is for those times when you just might need to tell (rather than show). It helps students to have a list of synonyms (cheerful, dejected, fuming, distraught, unruffled) for common feelings (happy, sad, angry, frustrated, calm). If they keep this list in their writing folder, they can refer to it throughout the year, and you will notice richer language in their revisions. Posted July 2, 2012 & filed under Fiction, Lesson Plan, mentor text, Notebook. “Why, thank you. Would you like to borrow it?” asked Mr. Fox. “Then, I accept,” said Mr. Squirrel, and off he went with the beautiful coat. So, on it went every day. Mr. Squirrel went to Mr. Fox’s and complimented him on something, and Mr. Fox would let him borrow it. Then one day, Mr. Fox had nothing left. He went and asked Mr. Squirrel to return his things. The squirrel refused, and Mr. Fox learned a valuable lesson: beware of flatterers. Posted June 29, 2011 & filed under Lesson Plan, mentor text, Notebook, Poem, Student Writing. One of my favorite lessons to teach this year was the Companion Poem. I based the lesson idea loosely on William Blake’s companion poems from Songs of Innocence and Songs of Experience. In these two books Blake included some poems by the same title and generally about the same topic, but written from different perspectives. The narrator in Songs of Innocence typically speaks from a place of lighthearted joy and youthful vigor. The narrator in Songs of Experience usually speaks from a place of maturity and caution. Here is an example of a “nurse” who is supervising children who refuse to go home at sundown because they are having too much fun laughing and playing in the fields. In the first poem the nurse shares their joy; in the second poem she thinks they are wasting time. And all the hills ecchoed. The days of my youth rise fresh in my mind. It is fun for children to think about an event from two different perspectives. The companion poem gives them the chance to do just that. It is also possible to provide broader guidelines for this lesson and explain that companion poems don’t have to be written by the same person nor do they have to explore a contrary point of view. One poem might be paired with another poem based on the shape of the poem, the length of the poem, the language of the poem, the point of view of the poem, the theme of the poem, or some of other point of connection. If I use this broader interpretation, I am never disappointed. The kids like it because there are plenty of choices involved, and I love the diversity of poems produced. To set up this lesson, just hand out a page with 5-7 poems on it, different styles, different authors, different topics. The students pick one that they like and cut it out. They glue it to a piece of colored construction paper. At the top of the paper they write the words Companion Poems. Then the students write a companion poem on notebook paper, cut it out and glue it next to the other. It is easy to display these poems in the classroom. Posted June 13, 2011 & filed under Lesson Plan, Notebook. Posted April 13, 2011 & filed under Lesson Plan, Notebook, WITS People. 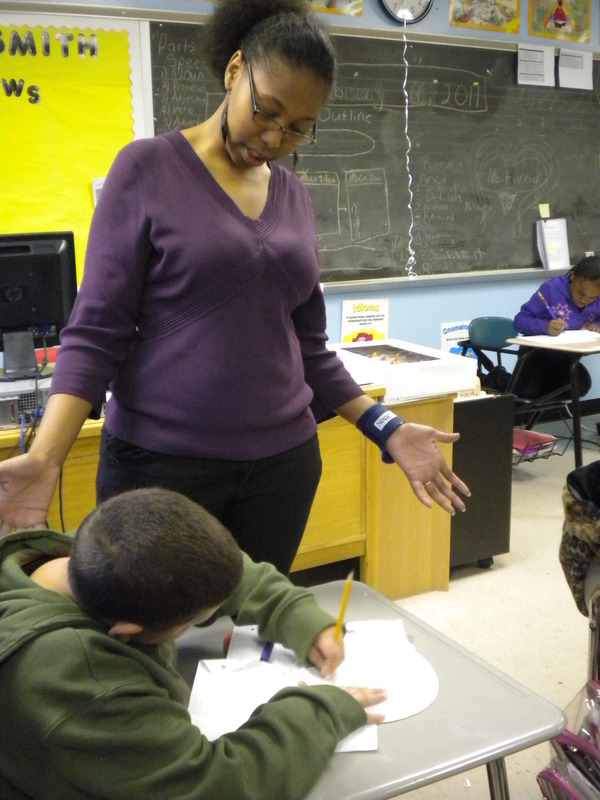 Deborah Wiggins inspires her 4th graders to create heart-shaped love poems. Photo by Jennifer Watson. Getting the children to focus is one of the many challenges Wiggins learned since she took on the class last fall. WITS writers are tasked with developing innovative teaching methods that encourage children to think of language in unconventional ways in addition to showing them that writing about their everyday experiences can be fun. Although each WITS writer is given a sample curriculum as a guideline, customizing the lesson plan to each classroom is no easy feat, not even for a seasoned teacher like Wiggins. 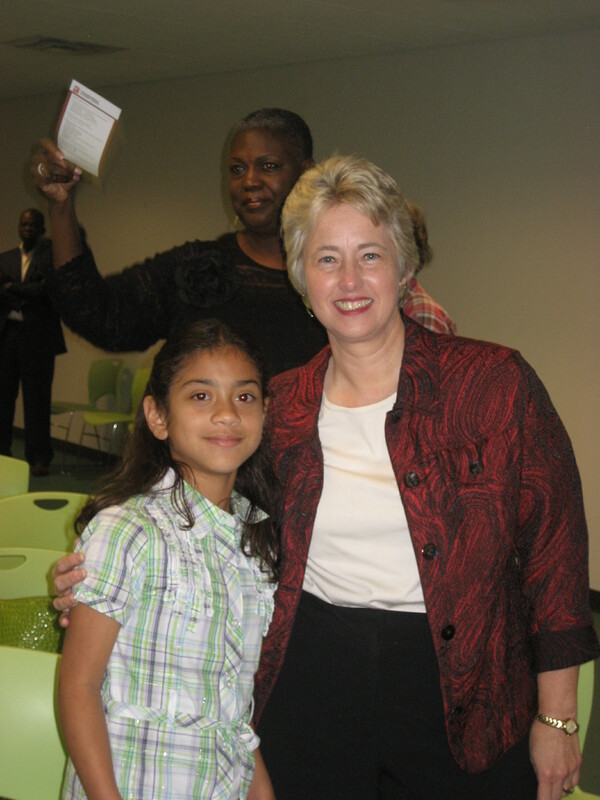 WITS student Guadalupe Hernandez and Mayor Parker. Photo by Gayatri Parikh. In the spirit of the holiday, Wiggins shared a heart-themed prompt to inspire love poems. Everyone was given construction paper, scissors, and pencils to create a heart and decorate it and asked to write a poem beginning with a simile. The children read their work aloud, and the results were beyond charming. What impressed me most was the individual attention Wiggins gave to every student and her ability to draw on their emotions in a way that got them excited about describing their hearts’ desires. Wiggins’ natural gift of connecting with her audience as a spoken word poet is a skill she transfers exceptionally well as a teacher. In a recent public performance she was invited to showcase both talents at the kickoff event for Public Poetry, a reading series established to celebrate poetry in the community. She brought along Guadalupe Hernandez, a 4th grader from E.O. Smith, to read poems in honor of National Poetry Month. Of the featured poets including Wiggins, Mayor Annise Parker, Rich Levy, Martha Serpas, and Eva Skrande, it was Hernandez who stunned the crowd with her two poems “Diamonds” and “Untitled” (below). And our stuff flies away. Her courageous performance was a testament of how writing “transcends the page” and manifests itself into an experience memorable enough to make a teacher/writer/poet’s heart incredibly proud. Posted September 6, 2010 & filed under Fiction, Lesson Plan, mentor text, Notebook. This story basket activity ensures the active participation of all students in listening to a book read aloud. Originally used with Cat Goes Fiddle-i-fee, it can easily be adapted to any book by printing and laminating images of the story’s characters. Additionally, the students could make representations of the characters in the book as a pre-reading, art project. Have the students sit in a circle on the floor with the “story basket” in the center which contains characters and farm animals from the book. The students should each take one animal from the story basket as the book is read aloud, listen for the appropriate time to place their character back in the basket. Posted August 31, 2010 & filed under Lesson Plan, Notebook. The WITS approach to teaching creative writing often springs from the inspiring writing and art that we love. Here is a lesson–although not originally ours–that exemplifies our work with young children. Many times, students forgo planning and brainstorming activities and immediately begin writing. This lesson utilizes a preliminary art project as a method of getting the students to brainstorm without realizing it. During the poetry writing portion of the lesson, reading an example poem and discussing the symbolism used in it is an important step in encouraging the students to use symbolism in their own poetry. Finally, sharing their poetry aloud with the class prompts revision in the friendliest and most comfortable of ways. Begin by showing Sara Fanelli’s My Map Book to the class. Pass out a blank sheet of paper to the class and instruct them to draw pictures of things that are in their heart similar to the maps they saw in Fanelli’s book. After fifteen minutes of drawing, stop them and reveal that they all just engaged in brainstorming. Share an example poem with the class. It is important for the students to see an example of how the words in a poem such as this one convey more than just their literal meaning. Discuss the symbolic meaning of each line of the poem, asking for student input with each new symbol. My heart is made of rubies, antique buttons, and pencil stubs. My heart is a piñata filled with clementines and caramels. My heart is a tiny white finch singing in her nest of thorns. My heart is a silver snowflake melting on your tongue. When students begin to write their own poems, challenge them to use their words to symbolically describe what is in their heart, rather than writing a list of all the things they drew on the map of their heart. After fifteen minutes of working independently on their poems, pick volunteers to share their poems with the class and then let those volunteers choose two students to say one thing they liked about their poem and one thing they wondered. The readers should take the feedback from their classmates and use it to revise their poems. Allow all the students who did not share with the class to pair up, read their poem to their partner, and get feedback to use for revision. books that won’t ever stop. a gray morning in rain. My heart is filled with sweet chocolate. My heart is filled with snowy afternoons in Italy. If you try this exercise with your students or if you do it on your own, feel free to share the results with us. Posted January 23, 2008 & filed under Fiction, Lesson Plan, Notebook. Sometimes students resist revision because they are physically unable to envision how they can add or move text around, as we have learned to do on our computers. Story surgery is something students enjoy because it’s almost like an art project. This is an intense, time-consuming activity that often gets very messy. But writing isn’t a tidy process inside one’s head, so why should it be on paper? Surgery tips: Many students cut straight across their paper, disregarding where a sentence begins or ends. This will ruin their surgery. Model cutting around sentences. I don’t allow students to glue down their revised piece until they’ve reread the whole thing over again. Story surgery works best with third graders and older. Supplies: scissors, glue, their writing, another larger sheet of paper (not lined), an envelope. 1. Do not let children write on the backs of their papers for the piece you want to conduct the surgery on. 2. Model for the children how story surgery will work, using a sample piece of writing. 3. As you are modeling, have students give you ideas on what needs to be Crossed Out, Added, Rearranged, Exchanged (C.A.R.E.). 4. Actually cut the paper and move the text apart, you may add the new ideas (on the larger sheet of paper) in the new space you’ve created. 5.Reread all of the changes you’d made to your piece. 6. Paste all of the text that you want to keep onto the larger sheet of paper. 7. If you’ve had students write the dialogue and thoughts of characters on Post It Notes, have students incorporate that into their surgery. 8. In an envelope, students save the sentences, phrases, and words they’ve “cut out” of their final piece. Posted January 11, 2008 & filed under Lesson Plan, Notebook. To encourage my students to revise, I bring in this lesson by Marcia Chamberlain. Students as young as first grade can learn to use the caret and delete editing symbols. Before students revise their individual pieces, we revise a piece of writing as a class. I bring in a carrot to help teach using the “caret.” Students use the carrot to point to where they want something added. To practice deleting, students take turns leading the class in making the loop de loop sign in the air; we create a funny noise to make with the movement. In the above example, the original line of the poem read, “the sound of the big dolphins.” The students agreed that ‘big’ was a boring word, so they replaced it with ‘humongous.’ I asked the students to create the actual sound they believed dolphins make, so we could include that in the poem. “Tri tri” is what they came up with. Then it’s time for students to revise their own pieces. I bring in red pens for students to revise with or let students select one of their colored pencils. The novelty of writing with a new implement is often enough to make revising exciting and fun! Posted January 4, 2008 & filed under Lesson Plan, Notebook. I tell students that one way to develop their characters is by including their thoughts and dialogue. I draw a speech bubble and thought bubble on the board and then we discuss the differences. Students always catch on quickly because they read comics. As a class, we practice adding thoughts and dialogue to an example story. When it’s time to revise on their own, students draw speech and thought bubbles directly onto their paper with a colored pencil, so they can see the changes they’ve made. Another way to do this activity is by having students draw their bubbles onto Post It notes and then sticking them directly onto their draft. Even Better than Giant Bugs 1! 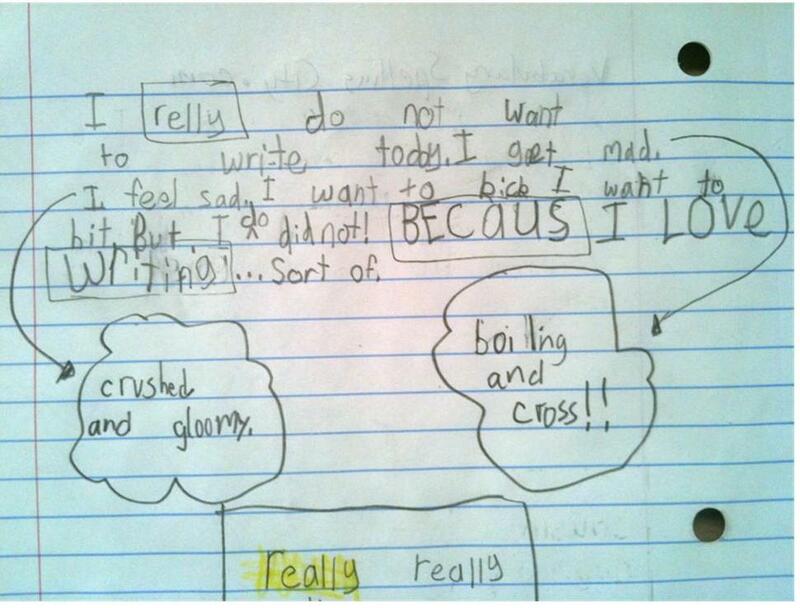 Posted December 19, 2007 & filed under Classroom Reflections, Fiction, Lesson Plan, Notebook. The Striking Viking Story Pirates of New York City celebrate children’s writing by turning their stories and poems into live musical performances with costumes, puppets and professional actors. What a great way to show appreciation for the creative genius of young writers! You don’t have to be a New Yorker to be part of the show, though. Any young writer can submit a story. I love that these performers are so committed to preserving the spirit of the works through their acting. While some of what they do is quite funny, at the same time they are completely sincere in their interpretations of the children’s work, celebrating its intentional silliness while reveling in its earnestness. The result is utterly charming. An easy way to bring performance into a writing class is to ask one writer read her or his story aloud while other students act it out. With young writers, dramatizing original stories is not only entertaining; it can also be a wonderful tool for learning writing skills such as pacing, dialogue, and revision. By noticing at which point in the story the actors get confused, a young writer can figure out what spots of the story may need elaboration. This can also become an opportunity to develop class cooperation and communication, as documented in the work of Vivian Gussin Paley and Patsy Cooper, whose books are well worth reading for anyone interested in children and their stories. There’s an amazing sense of accomplishment that a young writer feels when seeing her or his work on “stage.” Performance can become a fabulous aspect to add to almost any writing environment!